You are here: Home / Healthcare / Administrators for the Professions, Inc. Administrators for the Professions, Inc. ("AFP") provides administrative and claims services to Physicians' Reciprocal Insurers ("PRI"), a New York based medical malpractice insurer of 7,000 physicians with annual premiums of $125 million. 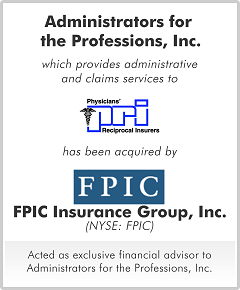 FPIC Insurance Group, Inc., the largest medical professional liability insurer in Florida, approached AFP with a pre-emptive offer to purchase the company. Along with AFP's counsel and management-shareholders, we developed a strategy to evaluate the offer without subjecting the offer to material risk. The negotiated transaction was concluded at $52 million, comprised of $44 million in cash and $8 million in FPIC stock, based upon AFP's prior year earnings of approximately $3 million. Other than the management agreement for services, PRI remained independent of FPIC. “I am writing to thank you for the incredible effort you and your staff put into our transaction. We could not be more pleased with the results. Although your parallel process was significantly more work for your staff, it was extremely valuable to have a variety of capital providers and buyers from which to develop the best transaction for Teresa and me. I found your honesty and ethics refreshing. In 2002, we approached nine investment banking firms regarding the sale of Ontic. The other eight told us it was a good time to sell and they could get us top dollar. You were the only forthright advisor in the group. You suggested we should wait for better market conditions at the risk of losing our assignment. Following your honest advice, we realized a considerably higher sell price. I also greatly appreciate all the time you spent with us and your 24/7 availability. With the many events in the sale process, it was wonderful having you always available to advise and discuss strategy.